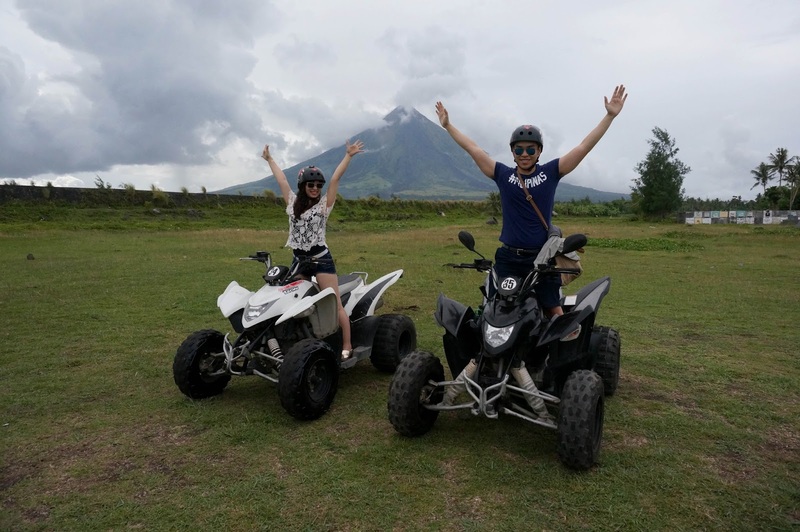 #ChaMike4ever ATV to Mt Mayon. 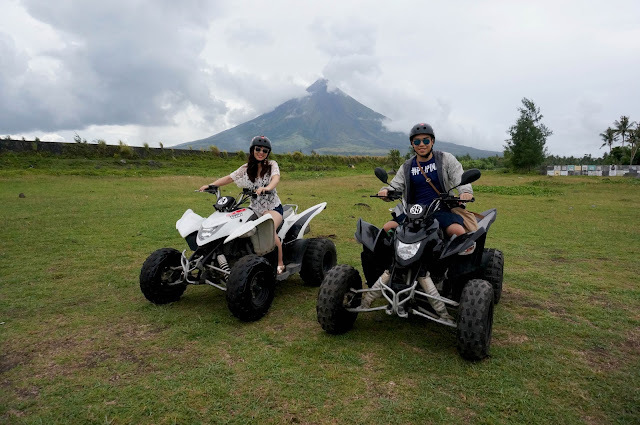 Riding an ATV to Mt Mayon has been on my travel wish list for a long time now. Even more when Zac Efron, my boy crush tried it when he came to the Philippines to promote a clothing brand (I was even at that event in MOA). 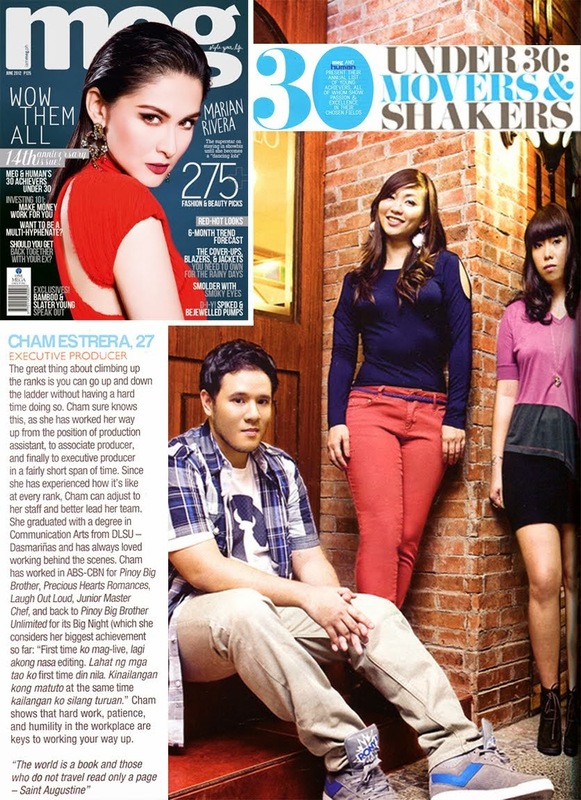 And finally after a couple of years, I was able to experience it with a hotter and even hunkier man (move over, Zac). 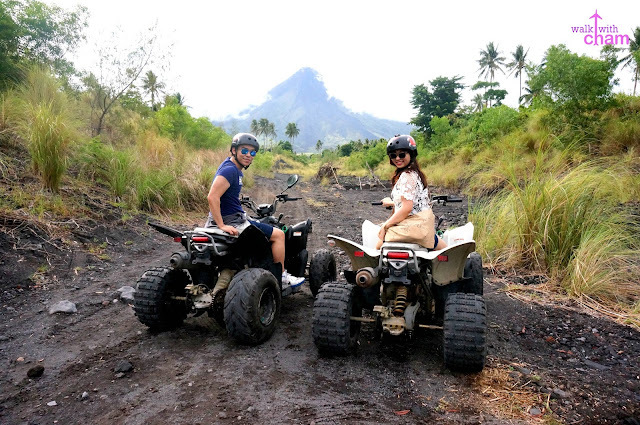 Mike and I celebrated our four years in Albay and on top of our agenda was of course riding an ATV. 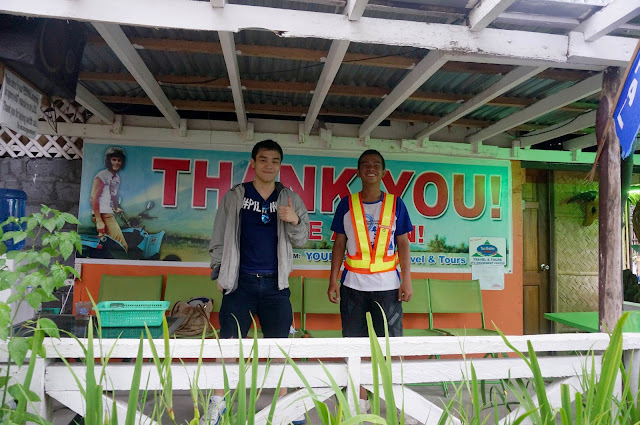 Upon arrival from Legazpi Airport a car rental driver approached us, Kuya Nestor offered to tour us around the famous spots nearby. 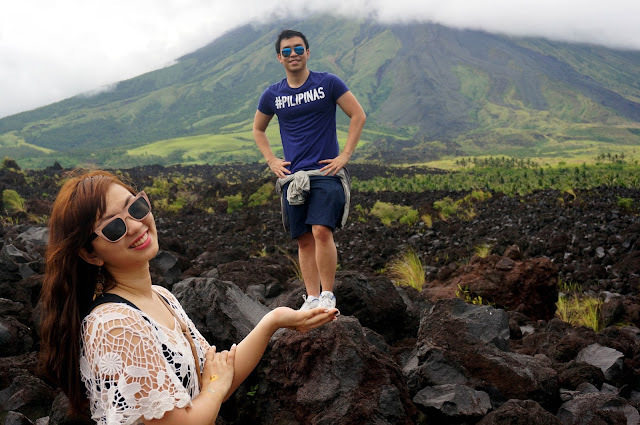 For P2,500 for 5 hours we accepted his offer. After we checked in at The Oriental Hotel we then started our city tour. The good thing about private car rental is that you can go wherever you want according to your plan. Because it was already 1pm, we first had a quick lunch at 1st Colonial Grill then proceeded to our first agenda, ride an ATV. 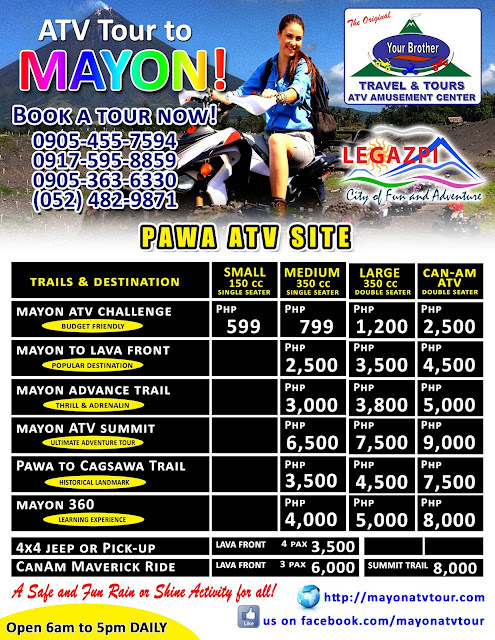 The most famous and reliable ATV service provider in Legazpi. 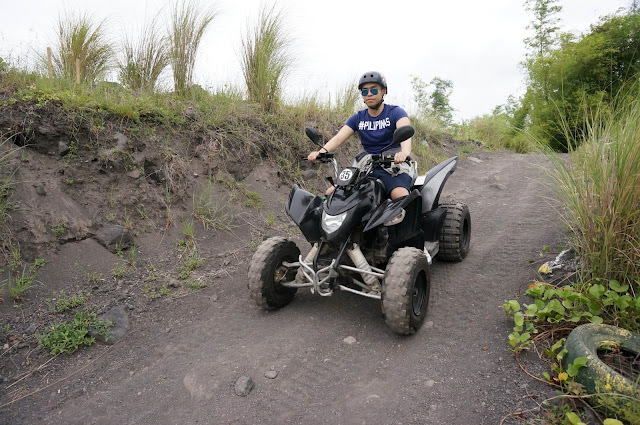 It is also the same ATV provider of Zac Efron's group. They have various ATV units available and different trails and destination depending on the guests preference. They operate whole year round- rain or shine. 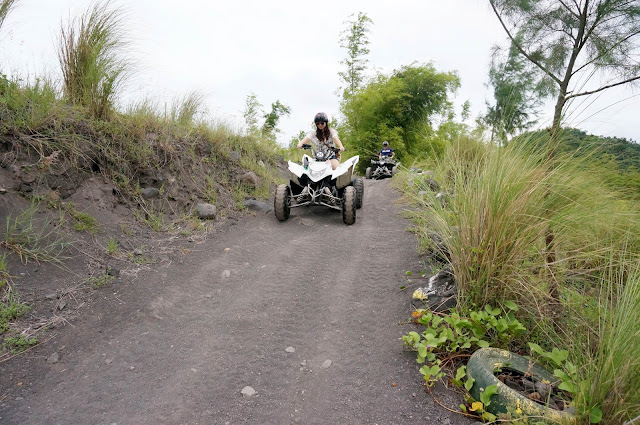 After much deliberation we settled for 2 Medium 350 cc single seater ATVs. 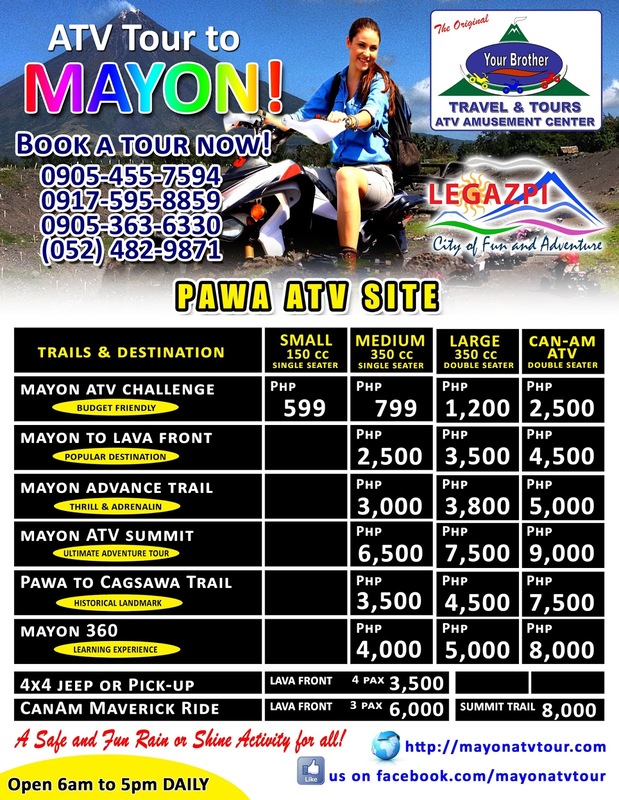 Our trail and destination was the most popular one, Mayon to Lava Front/Base camp. The 1 1/2 hour trail is about 18 kilometers back and forth from the ATV site to the Base camp. 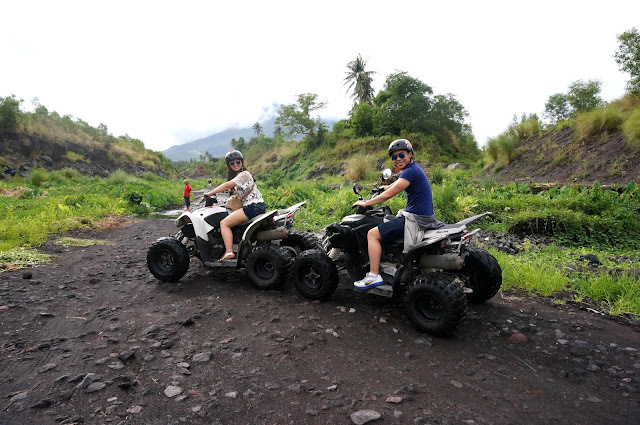 This trail also includes a bit of trekking to get a closer glimpse of the volcano. After we have chosen our unit, trail and destination we paid the amount of P5,000 (P2,500 each) and were required to have a short briefing for the rules and guidelines. 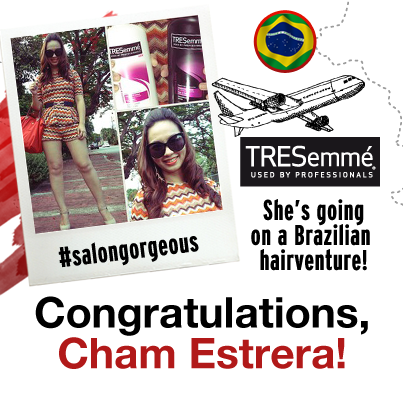 The package includes safety gears and helmets and a tour guide that served as our leader, coach and photographer. It was drizzling at first but eventually the rain stopped in the middle of the trail until we reached base camp. 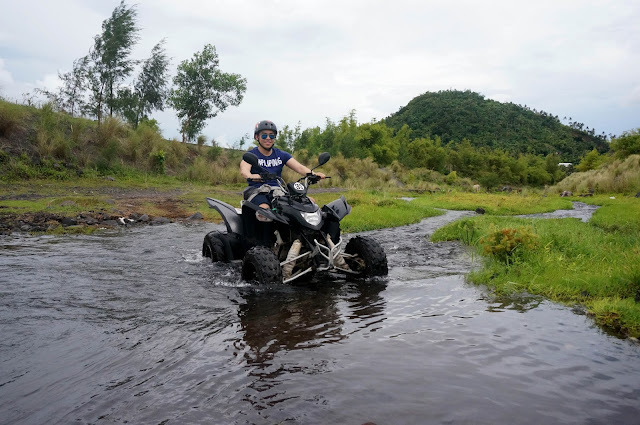 Being a first time rider of ATV I found it easy to drive, Ray, our tour guide never left our sight and was always there to assist us plus he's a good photographer too! He knew all the perfect spots for picture taking and offered to take videos of us while on the road. 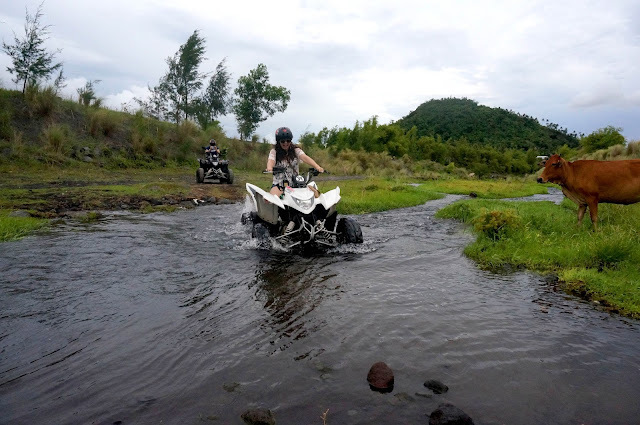 The trail is consist of uphills, downhills and streams to pass by. 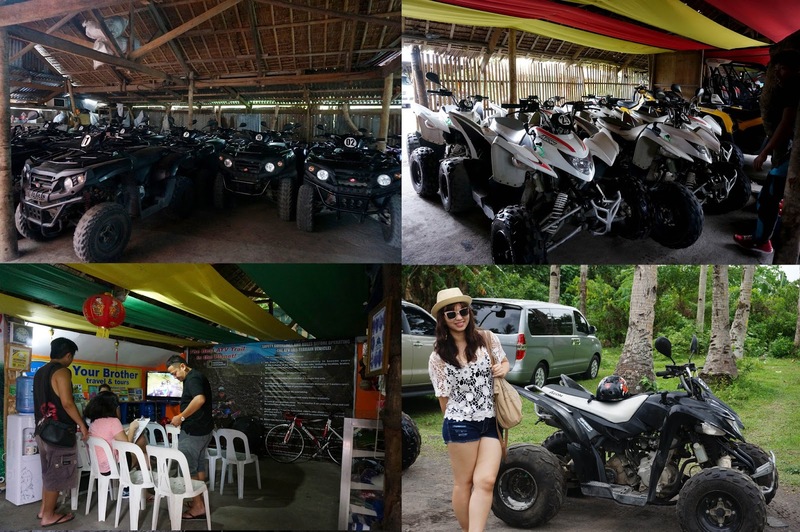 It was rocky, bumpy and muddy but the exhilarating experience was all worth it. 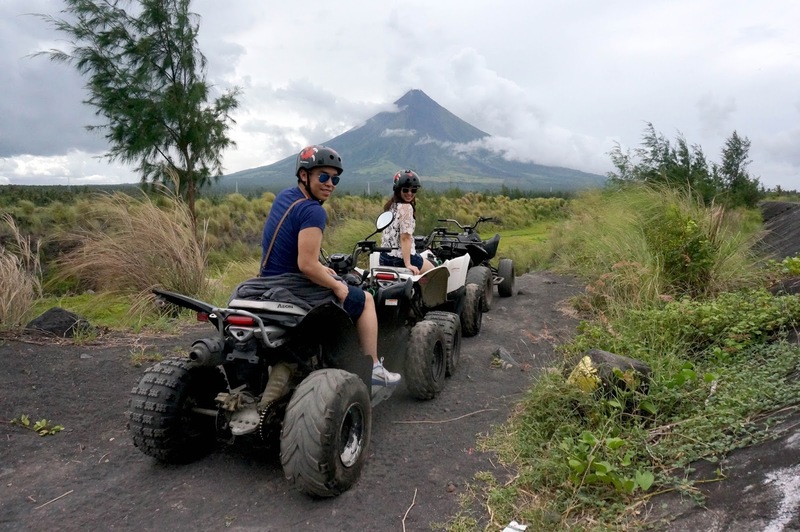 When we reached the lava front we parked our ATVs and paid a fee of P50 each for the entrance and tour guide (this time it was not Ray) going to the base camp. 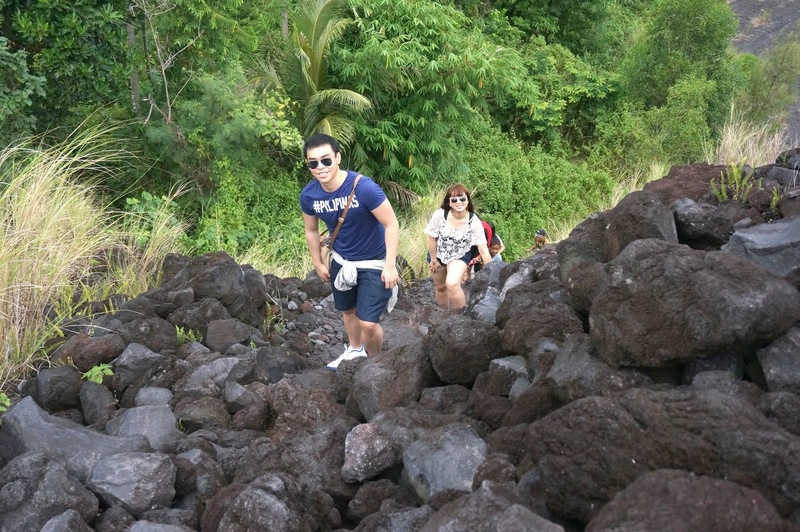 The trek is a good 10 minute walk although walking up the Lava Wall can be a bit tiring. 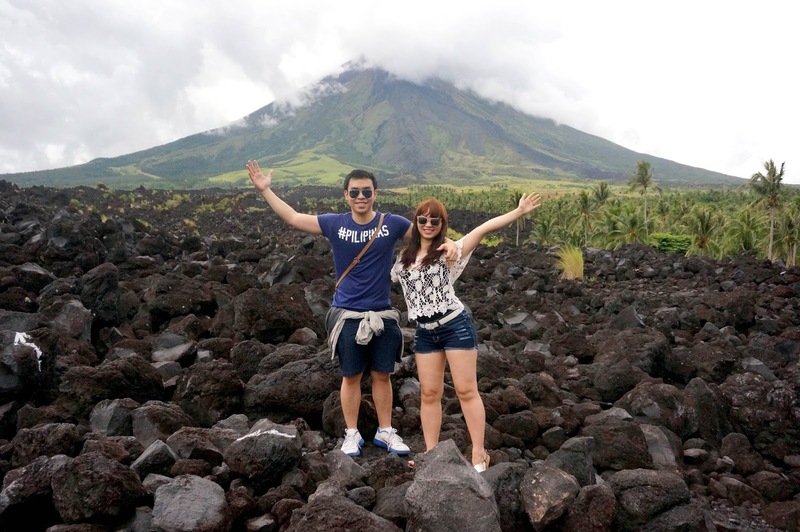 The Lava Wall is a 6 kilometer natural lava bed left by the eruption of Mt Mayon year 2006. This was the closest we got to Mt Mayon. Although the famous volcano didn't show her full figure at the time the whole ATV and trekking experience was unforgettable. 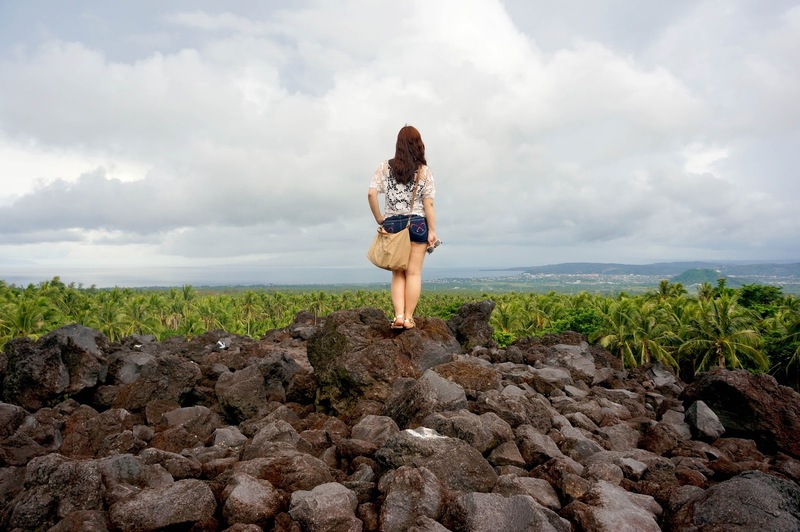 View opposite Mt Mayon. Overlooking the whole city. After our quick appreciation of the Lava Wall we hurriedly went back to our ATVs as we can feel the rain was about to fall. True enough it did! It rained really hard, good thing we drove back on a different route, that time we passed by a pavement road so we were able to avoid the muddy and bumpy course. It was one helluva ride! The rain effect added thrill to the already exciting experience. Definitely one for the books. Thanks to our guide, Ray for the fun times! 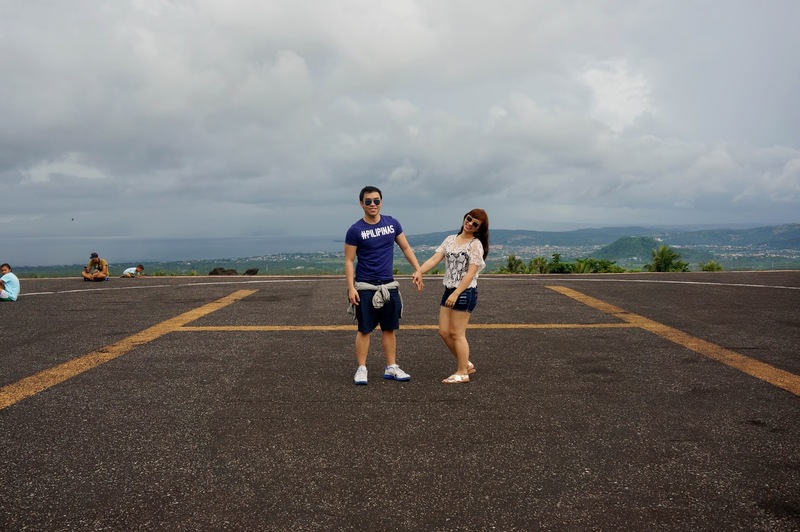 You made our Legazpi trip worthwhile. 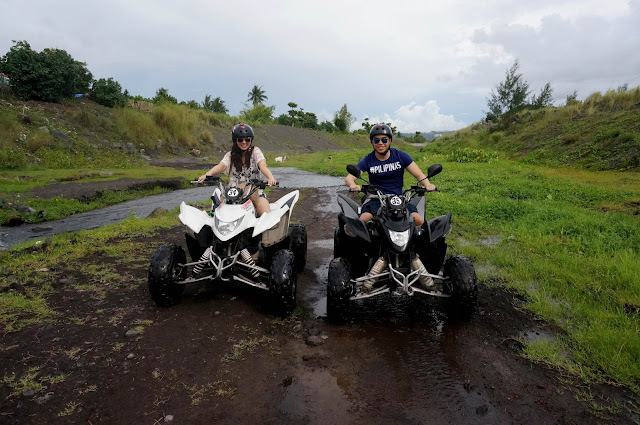 Right after our ATV experience our driver then proceeded to Cagsawa Ruins. Using Car Rental 8 you can discover the best car hire from over 50,000 locations globally.